PetSafe Staywell Magnetic 4 Way Locking Classic Cat Flap - Includes 1 Key 932EF POSTED TODAY IF PAID BEFORE 2PM! Item Description Available in White Magnetically Operated cat Flap (The old code for this cat flap is Staywell 32) Magnetic collar key Cat friendly transparent flap Cat Safe Action White Finish Wipe down easy clean (No Solvents) Cat control - 4 way security In Only, Out Only, Open or Locked Gives your cat the key to the door. With a silent latching system. Once installed there are no running costs. White finish with a 60mm tunnel (this tunnel cannot be cut as it contains a delicate mechanism). Information Sizes. Overall size : 224mm x 224mm, (8 7/8" x 8 /78") Cut out size wood : 169mm x 169mm, (6 5/8" x 6 5/8") Cut out size glass : 210mm (8 1/4") Diameter. 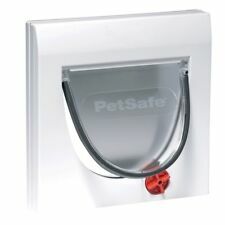 Staywell 4 Way Locking Pet Door White Cat and Dog Flap. Condition is New in box. Dispatched with Royal Mail 2nd Class. Condition is New. 2ND CLASS TO SIGN FOR. 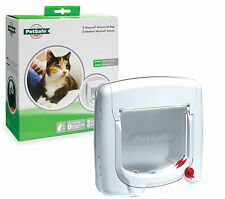 PetSafe Staywell Infra Red 4 Way Locking Deluxe Cat Flap - White (BNIB). Condition is used, but in fully working order. Dispatched with Royal Mail 2nd Class. 4-way Locking. Health, Beauty & Dental. Toy, Children & Baby. At Onogo, we strive to move with the world and all of its advances. Optional tunnel extension included. White finish with see through rigid flap. Description Measurements: Overall Size: 292mm x 292mm (11 1/2" x 11 1/2") Cut Out Size (Glass): 260mm diameter (10 1/2") diameter. (Single Glazed) Pet Max shoulder width: 180mm (7 1/8") Features: Universal Fitting Fits Sliding Windows & Doors White finish with See Through Rigid Flap 4 Way Security Lock Suitable for cats up to 18kg (40Ibs) Suitable for cats and small dogs Suitable for single and double glazed units* * It is not possible to cut holes in toughened glass or double glazed units except at the time of manufacture. Please consult a glazier. With the help of the Quick installation guide, the Manual 4 Way Locking Classic Cat Flap can be fitted into Walls and Doors of any material Easily. Stimulating your Cat’s natural instincts and curiosity the Classic Cat Flap extends your furry friends boundaries giving them the freedom and independence you will both love. Manual 4 Way Locking Cat Flap. Condition is New. I brought this as a replacement for my old cat flap but unfortunately my cat is no longer with us. Comes from a smoke-free home Dispatched with Royal Mail 2nd Class. Staywell 400 White Magnetic 4 Way Locking Cat Flap Door With Extra Key Options. Condition is New. Dispatched with Royal Mail 2nd Class. PetSafe Staywell Big Cat/Small Dog Pet Door (Frosted) - 4 Way Locking Flap 270E SKU# 270EF Description Give your big cat or small dog more freedom or control your pet's access to certain rooms. Our largest option for cats is available in frosted and white. WARNING: Small children can pass through door. Features For dogs and cats up to 10 kg Rigid, frosted plastic flap High-impact plastic frame Fits most standard windows and doors Manual 4-Way lock: in only, out only, open and locked Door Sizing Chart Pet Size Frame Dimensions Flap Opening Glass Cut Out Size Cut Out Size Max Shoulder Width Up to 10 kg 292 mm x 292 mm 200 mm x 180 mm 263 mm diameter circle 228 mm wide x 235 mm high with rounded corners 180 mm. Staywell Classic Manual 4 Way Locking Cat Flap. Locking options include in only, out only, fully open and fully locked. The Manual cat flap is suitable for any door, wall or material Suitable for cats up to 7 kg. Accessories Dog & Cat Doors Dog & Cat Door Accessories. 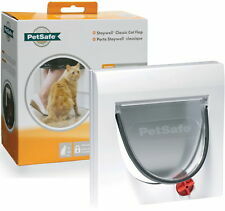 PetSafe Staywell 4 Way Locking Classic Cat Flap, Tunnel included, Easy Install, Durable, Pet Door for Cats. With the help of the Quick installation guide, the Manual 4 Way Locking Classic Cat Flap can be fitted into Walls and Doors of any material Easily.